MADISON, WI — The Wisconsin men’s basketball team’s Dec. 2 game against California will tip off at 3 p.m. (CT), the Big Ten Conference announced Tuesday. The game, which marks the eighth all-time meeting with California, and the first since 1986, will air live on the Big Ten Network. The Golden Bears (3-0) are coming off a 24-10 season a year ago in which they reached the 2012 NCAA Tournament. A limited number of tickets remain and can be ordered online at UWBadgers.com or by calling 1-800-GO-BADGERS. Wisconsin (2-1) hosts Presbyterian (0-3) tonight at 7 p.m. at the Kohl Center. That game will be live streamed on ESPN3.com. asketball teams ranked in the season’s first USA Today Coaches Poll, released on Wednesday. Indiana enters the season ranked No. 1, while No. 4 Ohio State and No. 5 Michigan round out the poll’s top five. Michigan State comes in at No. 14, while Wisconsin is ranked No. 21. Minnesota is receiving votes outside the top 25. MADISON, WI – The Wisconsin Men’s Basketball team which was picked to finish 2nd in the Big Ten behind Ohio State will their Red / White scrimmage this Sunday at 2:00 pm and the event will open to the public and more importantly will be free as well! "Taylor picked pre season All Big Ten"
and help take some of the scoring responsibility? Which if any of the young guns will step up and be key contributor’s to this years team? The questions go on and on, every day I’m asked a new question or given a new worry the fans have for this year’s team. These questions and worries I can’t answer even as a guy covering the team, it’s hard to tell what will happen who will take the step up, it’s all up in the air right now, but in a way isn’t most years like that around here… It’s why their isn’t panic ever around this basketball team, Bo knows the answers to all these questions, and we’ll all find them out very soon. I’m sure the Badgers will again make a return trip back to the Tourney for the 14th straight year, and like always it’ll be a fun ride. However if you are too impatient to wait and see what this team is going to look like, I hope to see you this Sunday at 2:00 pm at the Kohl Center as we all get our first look at this team that is filled with question marks, that seem to have easy answers, but need to prove the answer is correct…. I Can’t WAIT!! MADISON, Wis. — The University of Wisconsin and the Big Ten Conference announced the complete 2011-12 UW men’s basketball schedule on Wednesday. The slate is highlighted by a competitive non-conference line-up and at least 25 appearances on national television. The Badgers’ non-conference schedule features up to five games against teams that played in the 2011 NCAA tournament, including back-to-back contests at North Carolina on Nov. 30 and at home vs. Marquette on Dec. 3. UNLV, who went 24-9 a year ago, then comes to the Kohl Center just a week later on Dec. 10. UW is scheduled to have 25 of its 31 games broadcast on national television this year with five of the remaining six contests streamed live on ESPN3 orBTN.com. As a conference, over 100 Big Ten men’s basketball conference games will be televised nationally in 2011-12, with 44 appearing on CBS, ESPN, ESPN2 and ESPNU and 64 additional games on the Big Ten Network. • Wisconsin’s season tips off with an exhibition game vs. UW-Stevens Point at Nov. 5. This marks the seventh-consecutive season the Badgers have played a school from the WIAC during the preseason. • The Badgers host Wofford (Nov. 19) and Missouri-Kansas City (Nov. 22) at the Kohl Center as part of the Chicago Invitational Challenge. Regardless of the outcome in those games, UW will advance to the semifinals of the Chicago Invitational to take on Bradley at the Sears Centre in Hoffman Estates, Ill. The winner of that contest will take on the winner of BYU vs. Nevada on Nov. 26. • Wisconsin travels to Chapel Hill, N.C., to take on the five-time national champion Tar Heels on Nov. 30 as part of the Big Ten/ACC Challenge. The Badgers and Tar Heels have only met once, with UNC pulling out an 88-82 win in the 2005 Elite Eight en route to winning the 2005 national championship. UW has won its last six games against ACC foes. • The I-94 series continues as UW hosts Marquette on Dec. 3. The Badgers have won the last two meetings overall with the Golden Eagles and five of six match-ups at the Kohl Center. • A home-and-home series with UNLV wraps up when the Rebels come to the Kohl Center on Dec. 10. The Badgers lost at UNLV, 68-65, last season. UW also hosted UNLV in football this season, beating the Rebels, 51-17 in the season opener. • UW visits intra-state foe Milwaukee for a contest at U.S. Cellular Arena on Dec. 13. 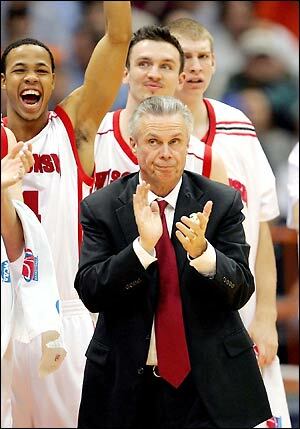 This marks the third time in Bo Ryan’s tenure that the Badgers have played at Milwaukee. • Wisconsin will play a minimum of 14 games vs. teams that made the 2011 NCAA Tournament and could face an additional 2011 NCAA tourney team (BYU) at the Chicago Invitational. In all, UW’s schedule features a minimum of 18 games vs. teams that played in the postseason a year ago. • The Badgers will tip off ESPN’s coverage of the Big Ten schedule on Dec. 27 when they travel to Nebraska for an 8 p.m. CT tip-off on ESPN2. This first-even Big Ten game for Nebraska comes on the heels of the Wisconsin football team also welcoming the Huskers to the Big Ten. UW hosts Nebraska at Camp Randall Stadium in a conference-opening game on Oct. 1. • The Badgers’ Dec. 27 Big Ten start date will mark UW’s earliest conference opener since the 1966-67 season, when Wisconsin tipped off at Illinois on Dec. 19. • The first CBS Sports broadcast of the conference season will also feature UW as the Badgers take on Michigan in Ann Arbor on Jan. 8. That game will tip off at either 12:30 or 3:30 p.m. CT.
• With the new 12-team conference, the Badgers will face four schools just once in the 2011-12 regular season. UW will travel to Michigan and Purdue in back-to-back games on Jan. 8 and Jan. 12 for their only meetings. Wisconsin’s only meetings with Northwestern and Indiana will come at the Kohl Center. • Wisconsin’s schedule also includes two wildcard selections during the final three weekends of the regular season. The Badgers will host Penn State on Feb. 19, play at Ohio State on either Feb. 25 or 26 and host Illinois in the regular-season finale on March 4. Television assignments (CBS or ESPN) for all three games will be determined at a later date.